By the time Buddhism reached Thailand, its images were well defined and governed by prescribed canons. 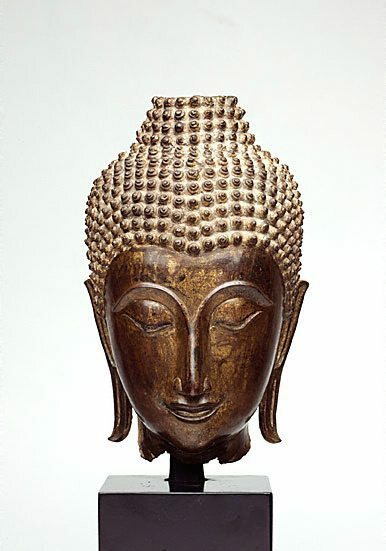 In an absorbing story of permutation and evolution, Thai sculptors of the Sukhothai period (1200-1400) created a transcendental and unique statement about the spirituality of Buddha within the canonical framework. The 32 major and 80 minor anatomical characteristics necessary to create a true Buddha image include the cranial protuberance symbolic of Buddha's supernatural wisdom; the elongated earlobes signifying his princely birth; the spiral curls symbolic of his great renunciation of cutting off his princely locks; a nose like a parrot's beak; and rounded chin like a lime or mango stone. The high flame finial which would have been attached to the crown of this figure, an innovation adopted from Sri Lanka, but now synonymous with the classic Thai style, is the Fire of Knowledge that burns away selfhood, ignorance and suffering. Sukhothai sculptors preferred bronze as their medium and achieved their greatest triumphs with it. Motivated by the belief that the more perfect the statue the stronger its power, they were driven to create such distillations of condensed spirituality as that captured here. 'Asian Art', AGNSW Collections, 1994, pg. 182. Christine France, Art and Australia (Vol. 37, No. 1) , 'A Matter of Taste', pg. 75-81, Sydney, 1999, 81 (colour illus.). Jane Hampson, Look , 'The many faces of Buddha', pg. 22, Melbourne, Mar 2001, 22 (colour illus.). Jackie Menzies, AGNSW Collections , 'Asian Art - India, South-East Asia, China, Tibet, Korea, Japan', pg. 173-228, Sydney, 1994, 182 (colour illus.). Art Gallery of New South Wales Quarterly , Sydney, Apr 1964, (illus.). Judith White, Look , 'A landmark for the city', pg. 16-19, Melbourne, Apr 2001, 16 (colour illus.). The Asian Collections Art Gallery of New South Wales , Sydney, 2003, 325 (colour illus.). The arts of Buddhism , Sydney, 2001, inside cover (colour illus.). Art Gallery of New South Wales picturebook , Sydney, 1972, 134 (colour illus.). Sunday telegraph , Sydney, 28 Jul 1963, (illus.). A concise history of Buddhist art in Siam , Japan, 1963.